In the advertising industry, a SPEC AD (short for speculative advertisement) is an ad you create on your own. You don’t work with the ad agency or client; you are simply using a SPEC AD to show your talents. 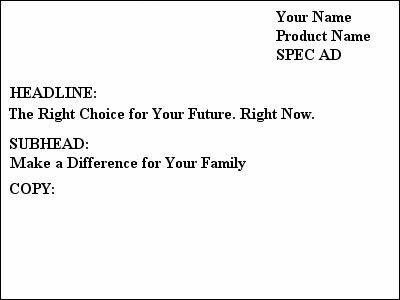 SPEC ADS are very common for budding copywriters and college graduates who have little to no experience under their belt. They are a great way for you to display your copywriting talent to a potential client or employer. Most copywriters who use SPEC ADS in their portfolio have limited or no copywriting samples to show in the interview process. It can be a print ad, a billboard, something online, whatever you want. But, for the purposes of growing your portfolio, stick with print. Find an ad you feel is missing something. Are the words not packing a punch? Does the headline fizzle? Is the call to action weak? Great, now you’re going to use this original ad to create your own version. A better version. This is called a SPEC AD. 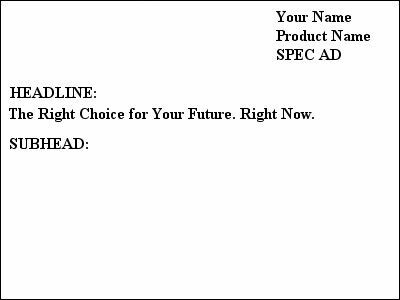 Prepare a simple text page with your name, the product and the word SPEC AD in the upper right-hand corner. Be sure to include the words “SPEC AD” because your goal is to show a potential client or employer your talent, and not to deceive them into thinking you really worked with this particular client. 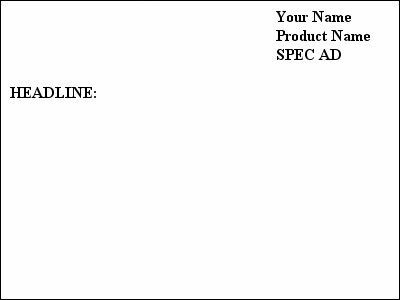 For example, if you were using an original Kraft Foods print ad as your SPEC AD, leaving off the words “SPEC AD” leads the potential client/employer to believe you worked with Kraft Foods and its agency to create the original. On the left side of the page, you’ll begin writing the ad in your own words. A SPEC AD isn’t going to be effective if all you do is change one line of the ad. You need to reinvent it. You want to create your own version of the ad. That means you start from scratch to give your take on how you would’ve written the ad. The purpose of your SPEC AD is to show off your own creative vision as well as your copywriting talent. Start with your headline. Simply type HEADLINE: and hit ENTER. Type in your headline for the ad. A headline’s purpose is to grab the potential customer’s attention. It also tips off readers on what it is you’re trying to sell — be it the product, image or an idea you want to convey. The best headlines for ads often work hand in hand with a visual, but that’s not always the case. Do you need a visual? Can you make the headline work without one? Think it over. This is how you are grabbing attention, so do it well. You may have a SUBHEAD you want to include. Type SUBHEAD: and hit ENTER. Subheads are not always used and they’re not always necessary. But you will want to use a subhead if the headline is enticing but somewhat vague. A subhead can quickly clarify what you want the reader to take from the headline, and it serves as a great lead into body copy. Subheads come in real handy when you’re writing a brochure because your headline invites readers into the brochure (example: Rid Your Home of Unwanted Pests!) and then subheads call out each individual section (such as Company Info, Experience, Consultation, etc.). Headlines are usually in a bigger font size than subheads too. Headlines get top billing, so-to-speak. Generally, your headline stands alone better in a print ad than offering up a subhead underneath. On to the copy of your ad. Type COPY: and hit ENTER. Now you’re ready to get to the meat of your SPEC AD. A powerful headline is going to capture the reader’s attention and the purpose of the copy is to keep the potential customer reading all the way to the end. This is your chance to captivate the reader and get them to call, visit a website, or even run down to the store. Write your copy and be sure to space the lines just as you would want them to read in the final version. In other words, you don’t want to create a 10 sentence long paragraph. Break up the sentences into smaller paragraphs so they’re easy to read — just as they would be in the final printed version of your print ad. Congratulation. You Have Created Your First SPEC AD. 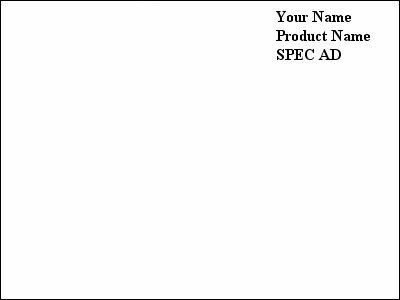 You’ve just created a spec ad! You have a simple white piece of paper. At this point, you may be wondering if you need to create a full-color print ad so it looks like what you would see in a magazine. Copywriters are not expected to be graphic designers. Your talent lies in writing and the copy is what a client/employee is going to be analyzing when interviewing you, not the design. If your copy isn’t strong, it’s not going to matter how many pretty colors and pictures you put into the design. Focus on your copy. Even experienced copywriters have basic text ads in their portfolio. Many copywriters update their portfolios to include their latest projects. These projects may not be in a final printed form so all they have to show off is the text they wrote. So don’t shy away from text and get caught up in the lack of visuals. However, you can dress up those text ads to make them stand out in your portfolio. And if you can, consult an art director. You’ll place the original ad and your version side-by-side in your portfolio (or website) for comparison. Take a decorative piece of paper and place it on one side of your portfolio page. You can do the same on the opposite side of the page. Of course, in these times, you should really have this on a WEBSITE, but the basic layout and style are identical. Place the original ad you chose to rewrite on one page and your SPEC AD version on the opposite page. Start about one inch off of the decorative paper to give you a nice clean edge. That’s It. You’ve Done It. Now…Do More. You’re finished! You now have your first SPEC AD in your portfolio and ready to go. Write more SPEC ADS to give your portfolio more content.